‘Catnip’ is the common name for a perennial herb belonging to the mint family. It is native to Europe and is an import to the United States and other countries. And to some cats, it is a gift from the gods. Given to the right cat, he/she will go nuts over it; Rolling over it, licking it, purring at it, kicking it… a pure moment of ecstasy for your feline. But wait – what just happened? Your cat walks away from it now seemingly uninterested. Time passes. 2 hours later, your cat starts to go nuts over the same catnip yet again. What’s going on? Apparently a chemical in catnip called ‘nepatalactone’ triggers the response from cats. This kicks off a stereotypical pattern in felines’ brains that are sensitive to the chemical. The reaction to catnip is inherited, and while some cats are totally unaffected by it, others just can’t get enough of it. Kinda like us humans and our reaction to hockey, right? Tip – 13 – Cats and catnip – what is catnip? Tip 71 – Cat purring – Why do cats purr? Just bought catnip for my cats for the very first time and 1 cat is dead by morning. I find Catnip deadly. As far as i know – catnip is a harmless herb and will not kill cats. 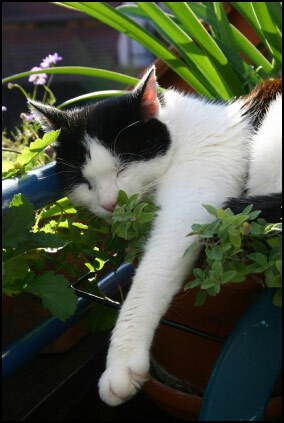 I just did a Google search on this though and some people suggest that some cats may have an allergy to catnip…. Until today though, I have never heard of this…. Of course it’s possible from my point of view that something ELSE killed your cat and the catnip thing is a coincidence. Only an autopsy can 100% reveal the truth. Either way – I’m sorry to hear your cat has passed on and offer you my deepest condolences.